Ht: 6’2” Wt: 190 lbs. 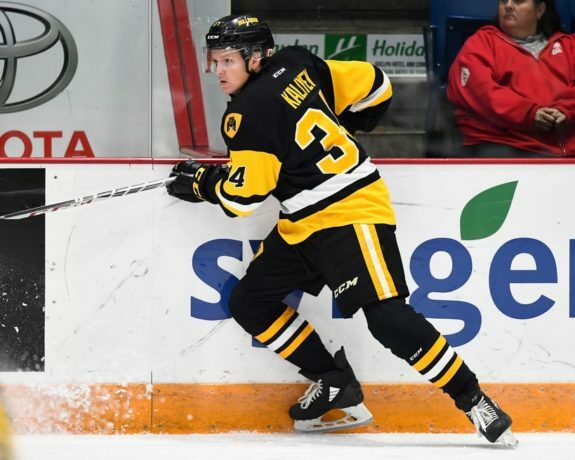 Ranked all across the first round, Hamilton Bulldogs’ forward Arthur Kaliyev is an offensive threat every time he touches the puck. At 17 years old, he reached the 100-point mark for the Bulldogs this year in just his second season with the team, following a 48-point rookie season. An OHL champ in his rookie year, Kaliyev was taken by the Bulldogs in the second round and 26th overall in the 2017 OHL Priority Selection. He is a talented winger who has the ability to fly past defenders using his strong skating and explosive speed. While he has the ability to throw goaltenders off with his quick release, Kaliyev does have some work to do when it comes to his defensive zone coverage. Over two seasons with the Bulldogs, he’s been able to show what he brings to the offensive side of the puck with 150 points through 135 regular season games. On top of that, he added 11 points in 21 playoff games in 2017-18 as the Bulldogs won the OHL Championship and made a Memorial Cup appearance. While he should be back in junior with the Bulldogs next season, it won’t be long before we see the likes of Kaliyev with an NHL franchise. Whether he’s a mid-round pick or a late-round selection, Kaliyev is likely going to be a first-round pick in the upcoming NHL Draft. A left-handed winger, he blew through the OHL competition in just his second season with the Bulldogs which likely helped his draft stock moving forward. With that in mind, look for him to go anywhere between 17th overall and 25th overall when it’s all said and done. He has some work to do on the defensive end of the game, but with a little development in his own end, Kaliyev should be able to find himself in a top-six role at some point early on his career. He has the offensive ability to be there, it’ll come down to how well he develops the rest of his game. While he’s still a young player, Kaliyev has already found himself that winning pedigree. As an OHL rookie in 2017-18, Kaliyev was named to the OHL’s Second All-Rookie Team on route to an OHL Championship with the Bulldogs.